My thoughts... Pretty gloomy on the whole but i'm trying to stay positive - and try not to take Trump et al too much to heart. Did i say how much i loath politics? i worry about my liver and this continuing damn cough - i want to get my teeth fixed! I am thankful for... my lovely hairdresser, Debbie. i'm on her visiting list [she went solo when the salon was closed] and it's a great having my hair cut at home and SO reasonably; she has an OAP rate but i always pay her more. *still way under £20* My hair has grown so long from my last visit, i felt positively light-headed as enough to stuff a cushion hit the floor! It was very irritating trying to cope keeping it clean while i was sick. From the kitchen last week... same old, same old really. i have spasmodic cooking binges, making stews, meat/veg meals and such-like sauces in quantity that i freeze in meal-size portions. Then i only have pasta or rice and potatoes, plus more veg to go with it, when i need them. i do have a large upright freezer, courtesy of an old friend, which is super useful and have space to store meat, chicken etc too. i simply need to remember to lift out those items needing to defrost in decent time! I am creating (crafts, sewing etc)... i rarely do what you'd consider crafts anymore but i have a stack of stuff i can sew. Including a pile of items needing repairs and alterations, when i get round to them! My adventures this week... (where are you going this week?)... Adventures? Hardly. i've rarely been out, due to the 'flu and the weather. i do tend to turn hermit in winter anyway and the battery in my scooter REALLY doesn't like the cold. i don't have undercover shelter, just a weather covering. Becoming well read (What are you reading this week?)... i have two stacks of books to get through, not made any less by getting into the 'Mortal Instruments' series! Isn't it wonderful, i never seem to run out of books to read? I manifest and co-create (what are your hopes and dreams this week)... We'll draw a discreet curtain over this one, shall we? Melody (what music are you listening to? even if it's just the sound of a bird).. Two wildly different albums - Alexander Armstrong [both of his CDS], lovely voice which won't be hurried and the amazing variety of songs which are just strawberries and cream. The other music could not be more different if it tried, Counterfeit who are a punk/rock group. They are still in early days and the two lots i have are the CD versions of EPs, five songs in all. They are bringing out a full album very soon and i shall be interested to see just how they are developing. One of my favourite things... This has to be watching Drew Pritchard's 'Salvage Hunters'. i was saddened to see the big to-do between Discovery [which includes the Quest channel showing SH] and Sky and was getting prepared to loose all the channels by today, most of which i don't watch but SH is one of them and Eurosport is another [mostly for the skating and stuff]. Luckily they have to come to an agreement in the nick of time and it's not going to happen now. Goals reached last week... Still working on getting well again and tidying up the house. It's horrifying how chaotic things get when you're not well and have to sit down so often; even to wash-up the dishes. i must do some more clothes washing, which i did manage to do nowand then as i don't need to do more than stick it in the machine and then the drier. 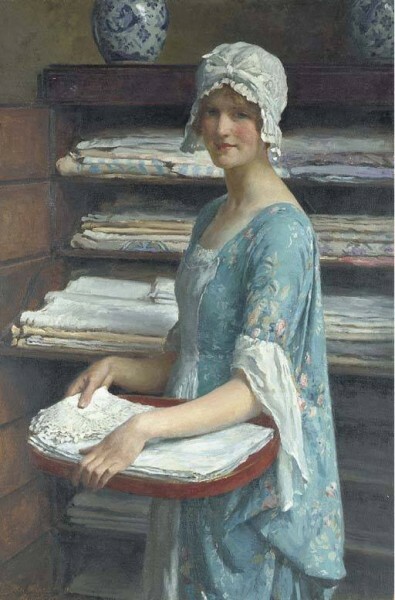 by William Henry Margetson - she's so peaceful somehow and holding lovely linens. That is a lovely peaceful picture!